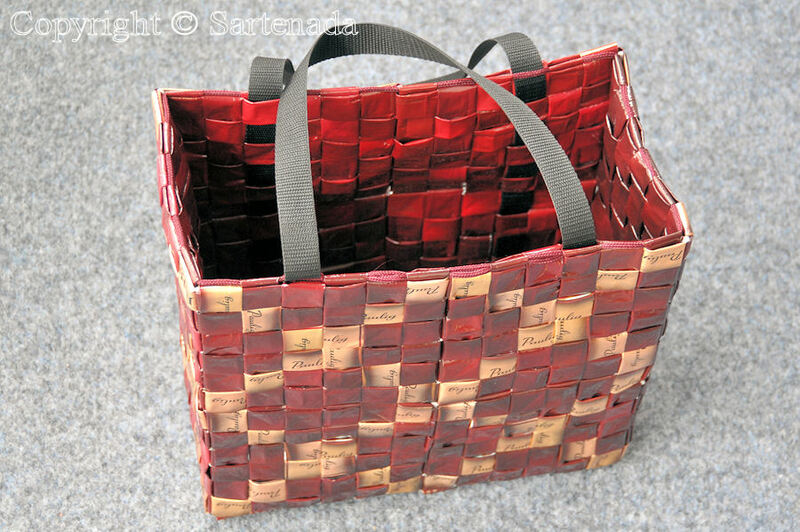 How to make shopping bag from coffee bags? 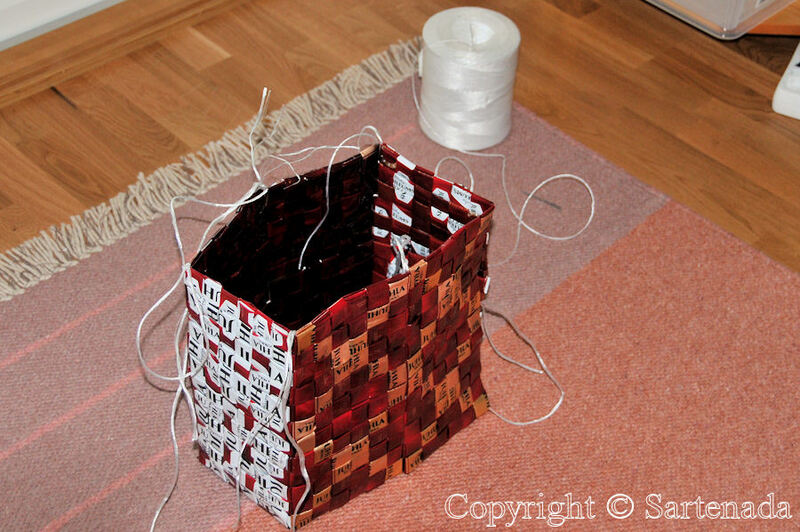 Have You thought that coffee bags can be reused? 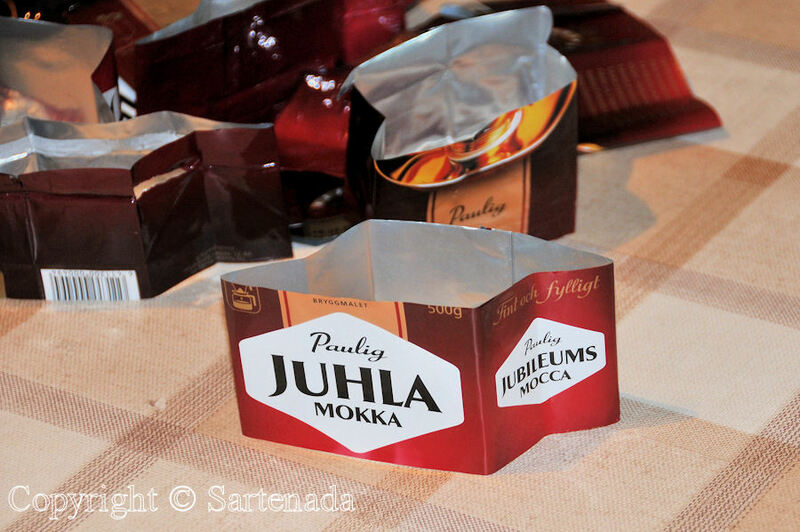 In Finland people make bags from coffee bags. They are very popular and man can see them in malls and shops. 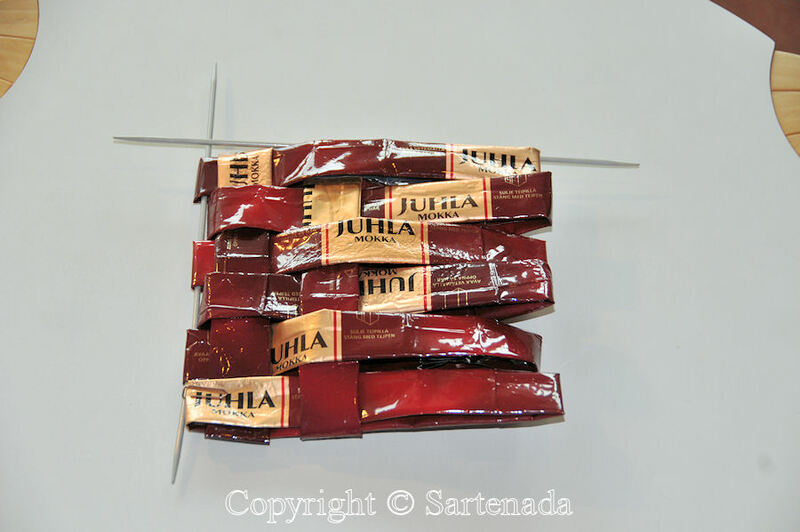 Models and patterns vary according to the imagination and patterns of different brands of coffee bags. Finally they are quite easy to make. How many coffee bags are needed for a bag? All depends on which kind of pattern man want to make, but a lot of. 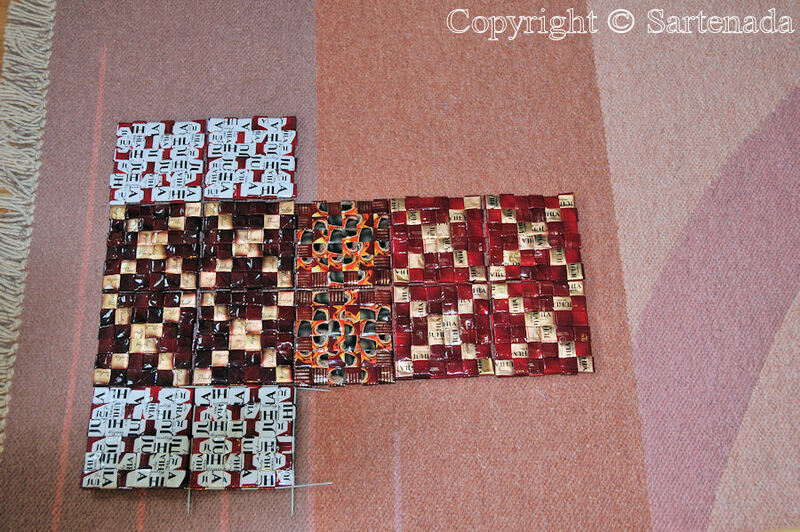 In order better to understand all this, I show at first three models which I have found in some quilting exhibitions and thus they are not made by my wife. After that my wife guides You how to make one model stage by stage. 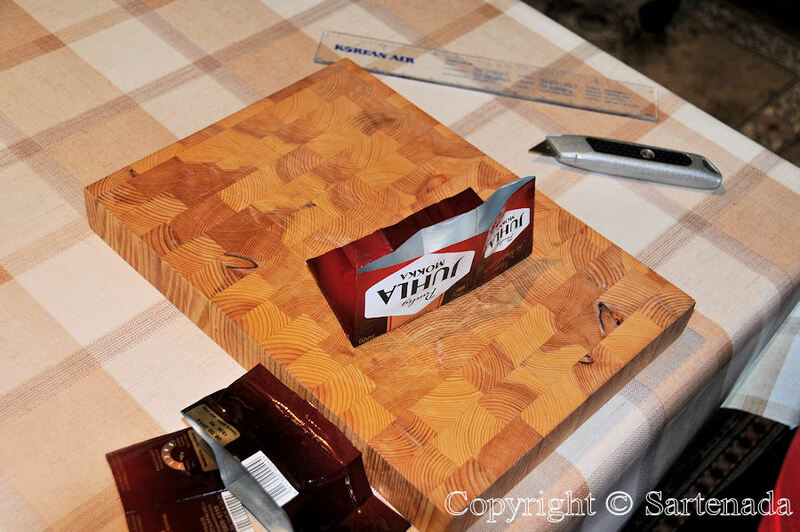 Accessories needed: coffee bags, knife, ruler, sticks or knitting needles, needle, yarn, chopping board and scissors. Joy of work! ¿ Cómo hacer bolsa de compras desde bolsas de café? 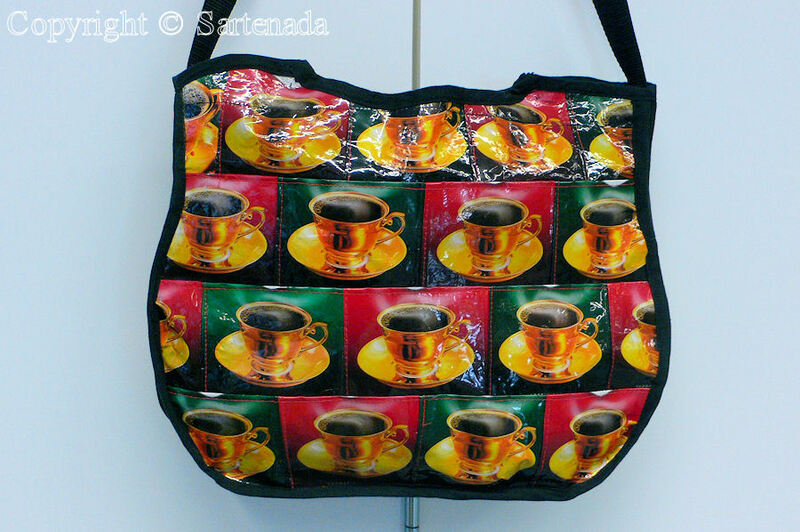 ¿Usted ha pensado que las bolsas de café pueden ser reutilizados? 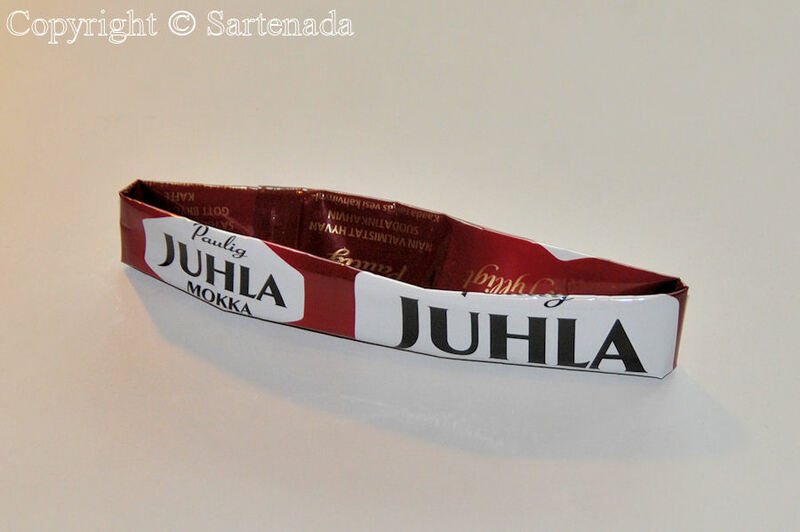 En Finlandia la gente hace las bolsas desde bolsas de café. Son muy populares y se pueden verlas en los centros comerciales y tiendas. 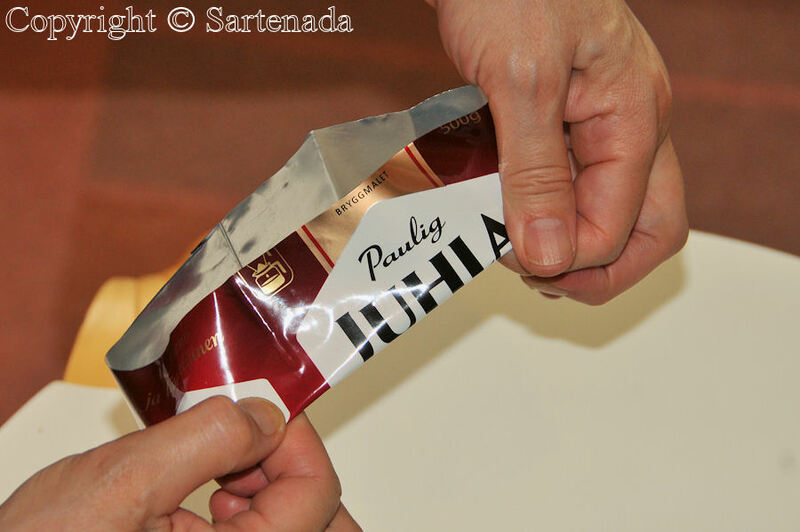 Modelos y patrones varían de acuerdo a la imaginación y los patrones de las diferentes marcas de bolsas de café. Finalmente son muy fáciles de hacer. ¿Cuántas bolsas de café son necesarios para una bolsa? Todo depende de qué tipo de modelo se desea hacer, pero una gran cantidad de. Al final para mejor comprender todo esto, para empezar muestro a vos tres modelos que he encontrado en algunas exposiciones de alamzuela y así que no están hechos por mi esposa. Después aqellas mi esposa le guía como hacer mostrando a vos un modelo paso a paso. Accesorios necesarios: bolsas de café, cuchillo, regla, palillos o agujas de tejer, agujas, línea, tabla de cortar y tijeras. Alegría de trabajo! Comment faire sac à provisions à partir sacs de café? Avez-vous pensé que les sacs de café peuvent être réutilisés? 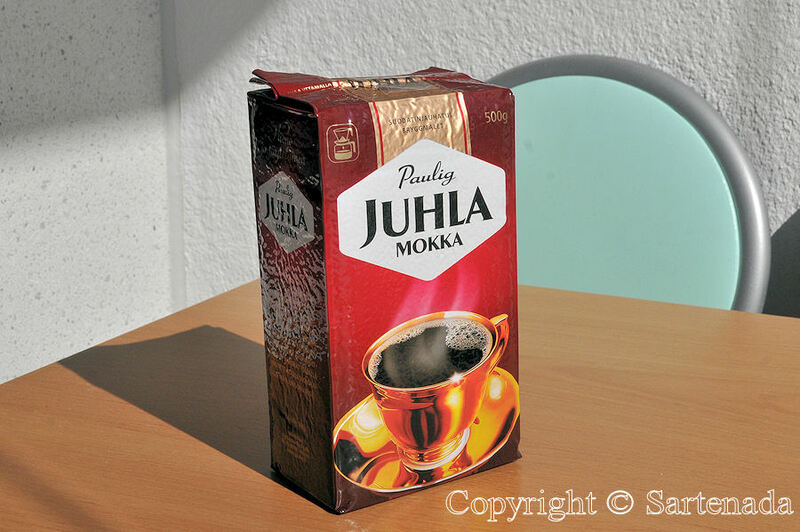 En Finlande, les gens font des sacs à partir sacs de café. Ils sont très populaires et on peut les voir dans les centres commerciaux et les magasins. Modèles et marques varient selon l’imagination et les modèles de différentes marques de sacs de café. Enfin, ils sont assez faciles à faire. Combien de sacs de café sont nécessaires pour un sac? Tout dépend du quel type de modèle on a envie de faire, mais beaucoup. Afin de mieux comprendre tout cela, je montre à vous trois premiers modèles que j’ai trouvés à quelques expositions de courtepointe et donc ils ne sont pas faites par ma femme. Ensuite ma femme vous guide comment faire une modèle pas à pas. Accessoires nécessaires: sacs de café, couteau, règle, bâtons ou des aiguilles à tricoter, aiguilles, fil, planche à découper et des ciseaux. Joie de travail! Como fazer o saco de compra a partir de sacas de café? Você já pensou que os sacos de café pode ser reutilizado? Na Finlândia, as pessoas fazem sacos a partir de sacos de café. Eles são muito populares e eles podem ser vistos em centros comerciales e lojas. Os modelos e padrões variam de acordo com a imaginação e os padrões de diferentes marcas de sacas de café. Finalmente, eles são muito fáceis de fazer. Quantos sacos de café são necessários para um saco? Tudo depende de que tipo de padrão Você quer fazer, mas um monte deles. Para melhor entender tudo isso, eu mostro para você no início três modelos que eu encontrei em algumas exposições de colcha e, deste modo que eles não são feitos por minha esposa. Depois minha esposa guia você como fazer um modelo passo a passo. Acessórios necessários: sacos de café, faca, régua, varas ou agulhas de tricô, agulhas, fios, tábua de cortar e tesouras. Alegria de trabalho! Finns drink a lot of café and that is why we have the only Coffee cup museum in the world / Finlandeses toman mucho café y eso es porque que tenemos el único museo de la taza de café en el mundo / Finlandais boivent beaucoup de café et c’est pourquoi nous avons le seul musée de tasse de café dans le monde / Os finlandeses bebem muito café e por isso que temos o único museu na xícara de café no mundo. Super sympa et très écologique comme idée. Celui de ta femme est très beau, et je n’aurai jamais pensé en en voyant un au bras d’une femme que cela était fait à partir de sacs de café. Merci pour le partage de cette super idée. Mon coeur chante en lisant de votre genre de commentaire. Merci beaucoup. Peut-être Vous ou une de vos amies commence à faire le nouveau sac de café de ce type en France aussi! Je Vous souhaite une agréable journée! Bises. Amazing! I am regretting every coffee bag I have ever thrown out. But there is hope. I drink almost as much coffee as a Finn! 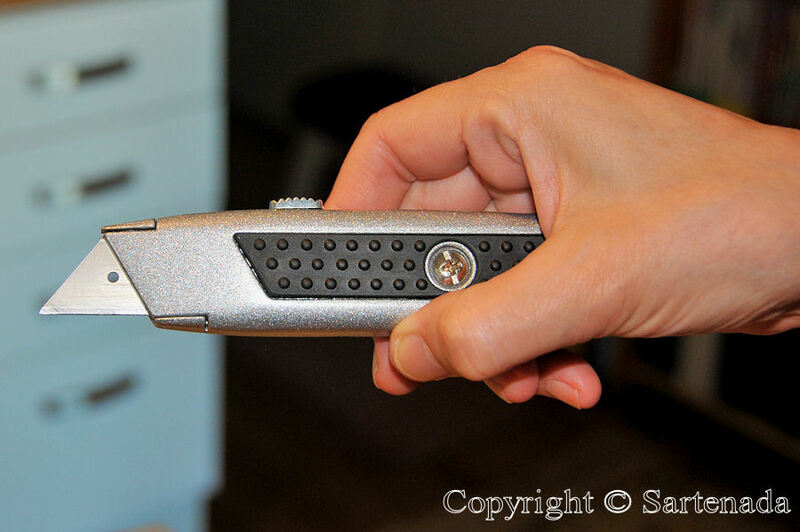 Your photos are excellent – the close-ups make it very clear how to do this. 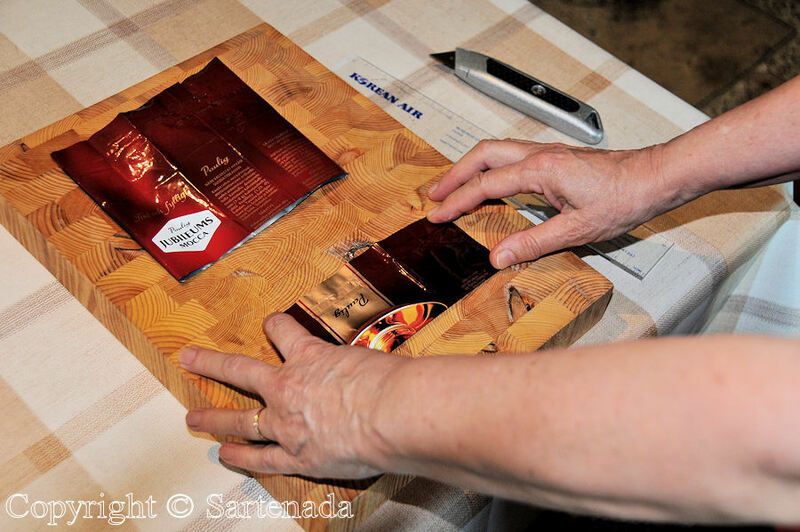 Thank you (and Anja, of course) for sharing this clever project! Thank You making so praising comment. Anja has been very happy when heard / read Your comment. Que bueno. Espero que tu esposa gusta la idea. Muchas gracias por tu comentario. Gracias por “the tutorial” ! 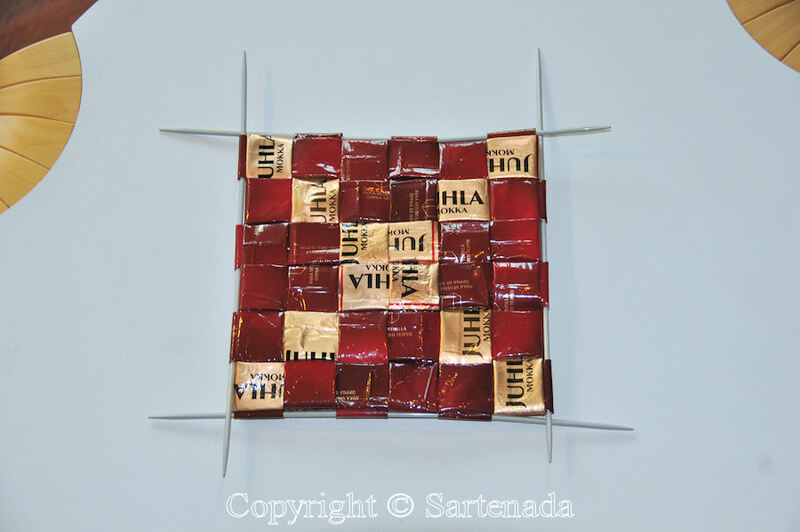 And for everything you post…..
What an amazing way of recycling coffee bags! I wonder who first thought of it? Thank You. I am glad that You love the idea. 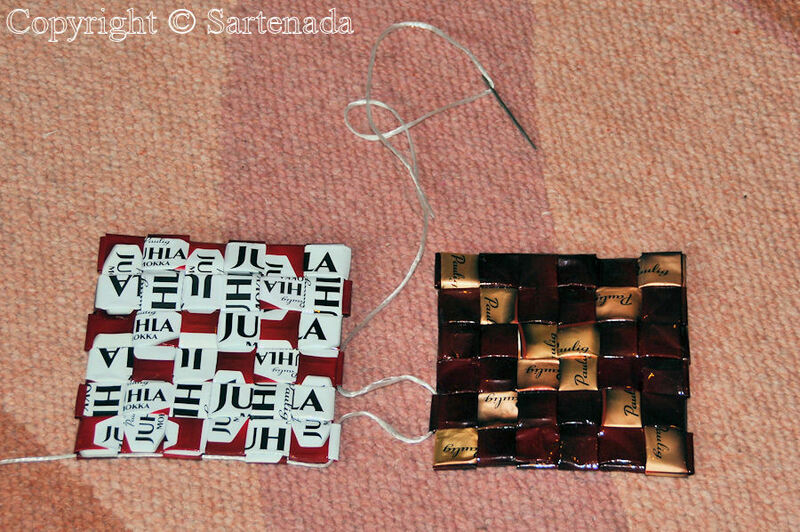 Well, the name is unknown, all this started already in the fifties when some people started to make pot coasters from coffee bag. So also did my mom. 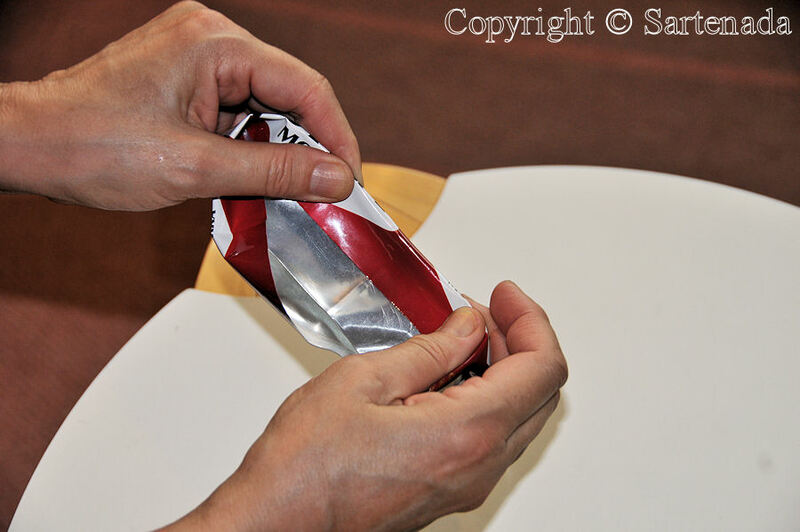 In the 1980s people made first coffee bags. In my link presenting the unique Coffee Cup Museum in the world after photos, there is one, which shows classic pot coaster for coffee pot. It is from the end fourth photo. 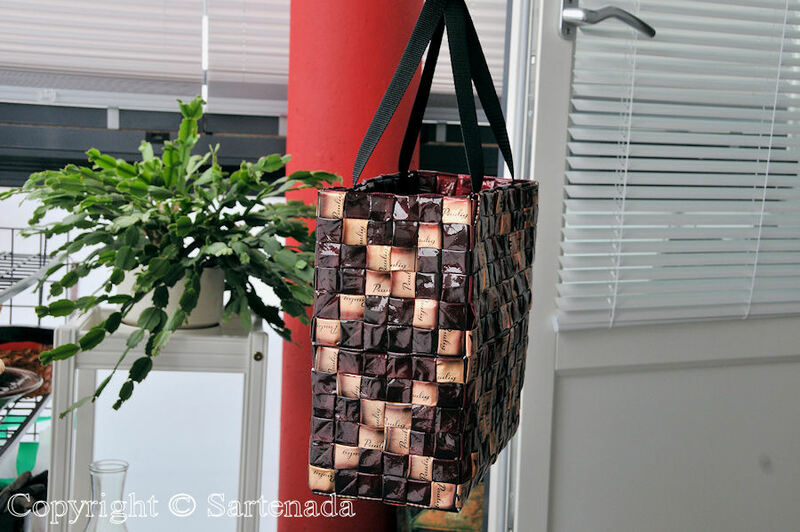 I was surprised to idea to make a bag from the coffee bags. 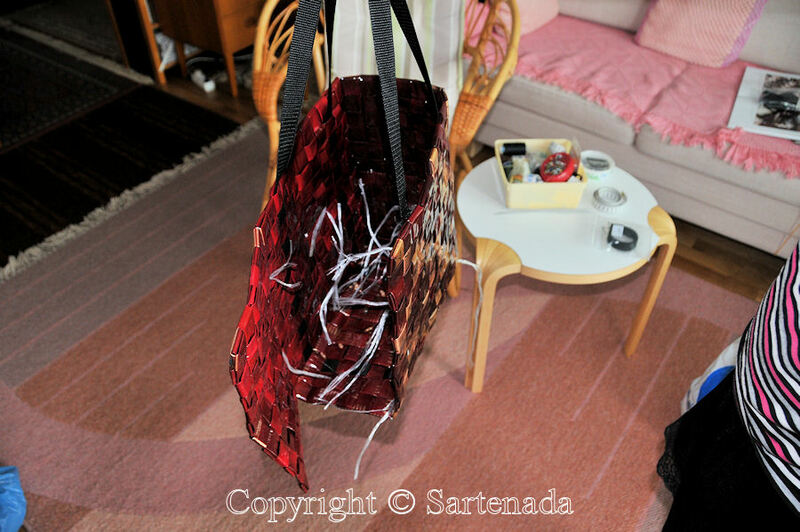 And I can understand that it is a wonderful product to see the bags. Sounds so great that there are “new” hobbies for You also. Thank You commenting. Thank You commenting my post and leaving Your kind comment. 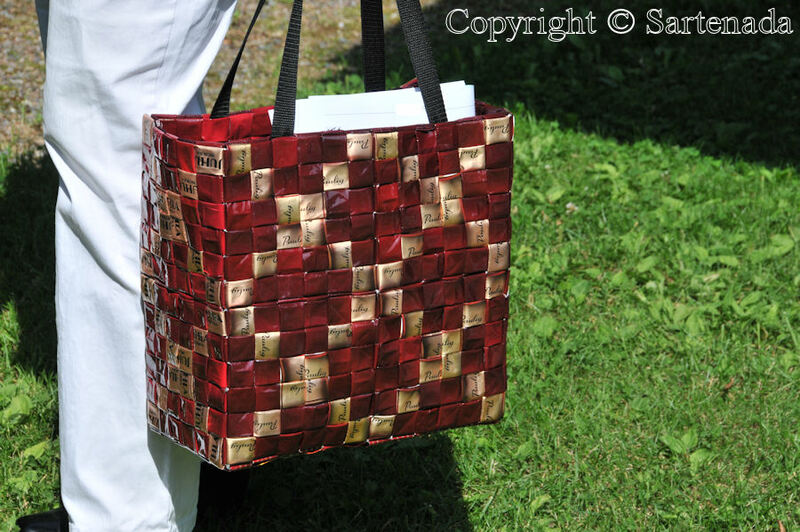 I think that these bags are easy for quilters! That is very clever, and a good idea! I am glad that You love this idea. Thank You for Your kind comment. I do not drink a lot of coffee so have not thought to recycle bags – what a wonderful idea, I will pass this on to others that drink a lot of it!! Thank You. 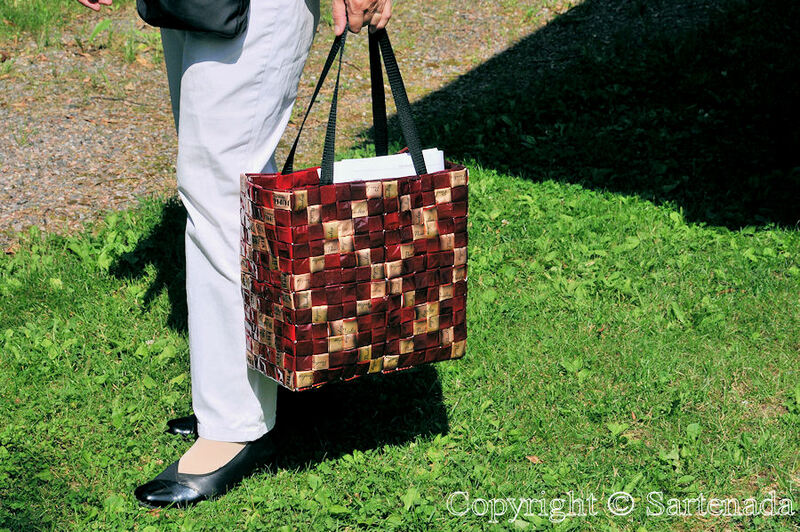 Well in Finland coffee bags are not the only ones to make these kind bags, but these are most popular due to their patterns. Love this recycling. 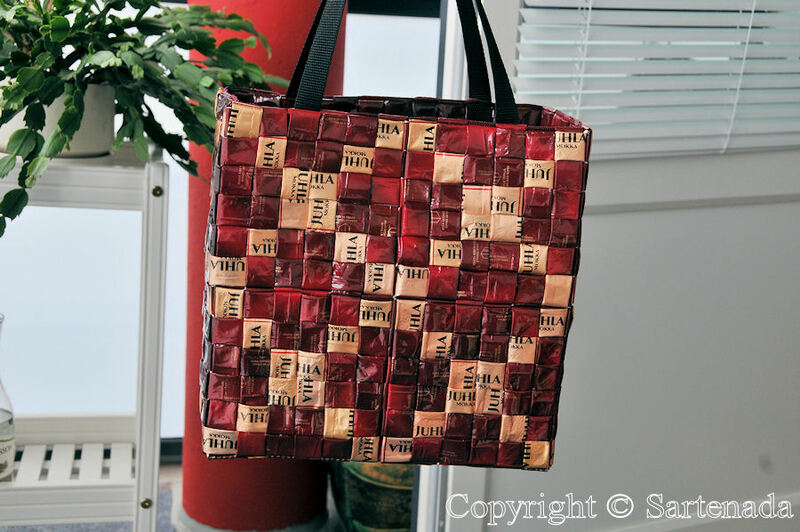 I have seen similar bags made from juice bags in South and Central America. 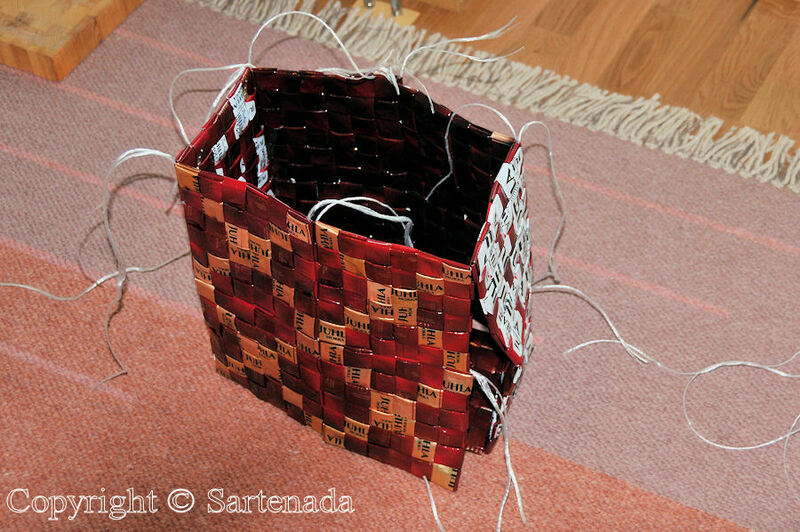 Yes indeed coffee bags are not the only material, but they are sustainable material. Happily many coffee brands understand what beautiful pattern means. Thank You commenting and visit. Fascinating! The very first time that I regret very much not to be a real coffee but a tea drinker instead. How do I get the “material” in this case? ^^ I really would like to try it after having seen your ingenious and detailed tutorial. 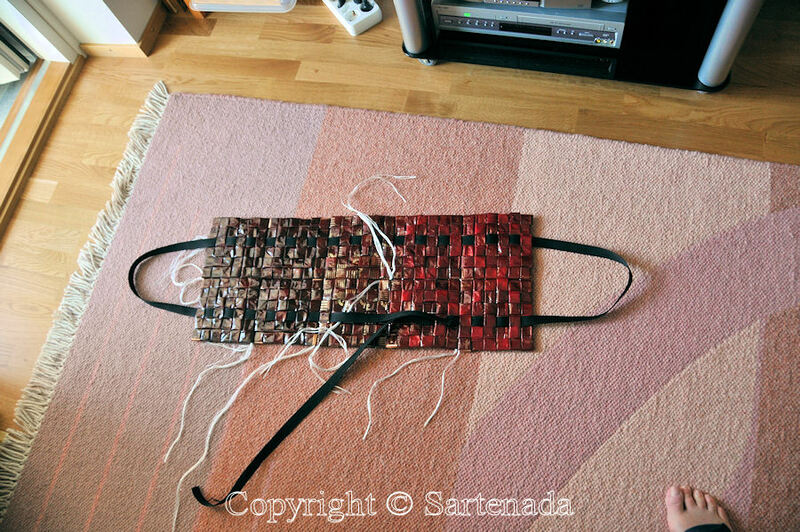 The bags are so special, so solid – and they seem to remain stable and even water resistant due to the material used and due to the weaving and sewing up. These bags look precious, classic and absolutely interesting what the pattern and colour is concerned. I’ve never seen such bags before and never heard about it up to now. It’s amazing. 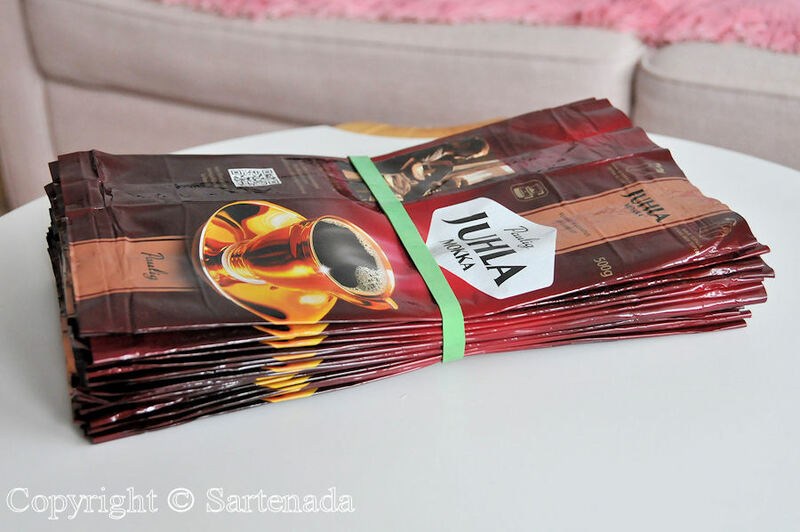 Well, Anja got many coffee bags from her brother and from my son. So three sources solved the problem. 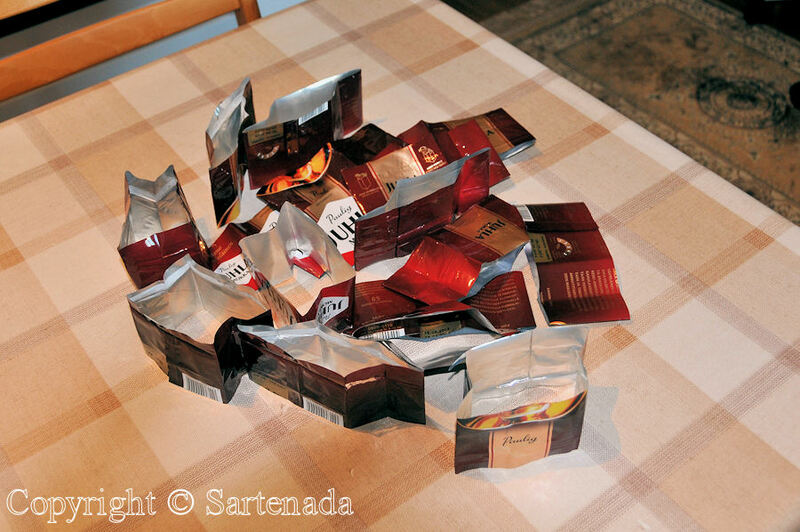 Maybe You tell to Your friends that please do not throw away empty coffee bags, but give them to me. Thank You very much for Your praising comment. Well, someday You’ll show Your unique bag made by You. Très bien que vous aimez l’idée. Peut-être quelque jour nous allons voir le vôtre aussi. Merci d’avoir faite le comentaire. Oi Matti! Estou muito feliz em visitar seu blog. Gostei muito deste post, tanto que tomei a liberdade de inserir uma de suas imagens em meu blog. Mas informei que você é o autor da foto, ok?! Também deixei um link direto para que meus leitores possam ver todas as fotos das sacolas feitas com embalagens de café! Sim, está bem. Eu e minha esposa estamos muito felizes que você amava o meu post. Bom Fim de Semana! Matti. 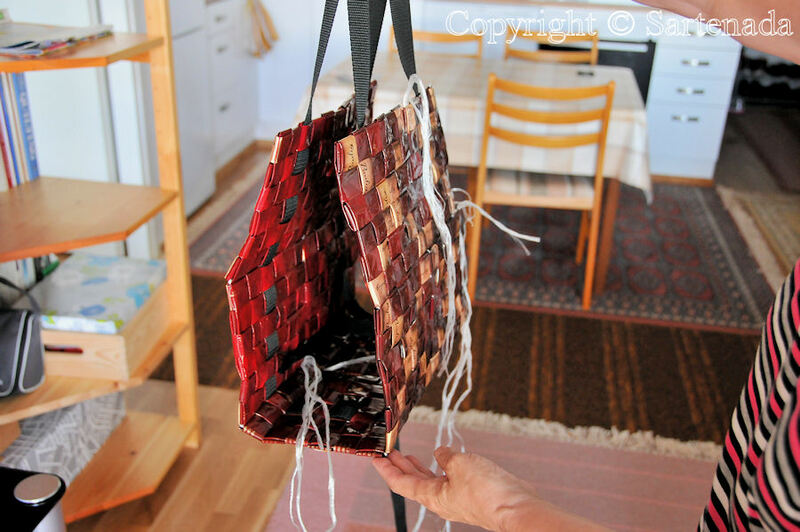 What a great idea, I would never have thought that the bags were made from coffee bags, great tutorial with clear photos, well done. Thank You praising my post. Thanks belong to my wife. She is happy when reading Your comment. 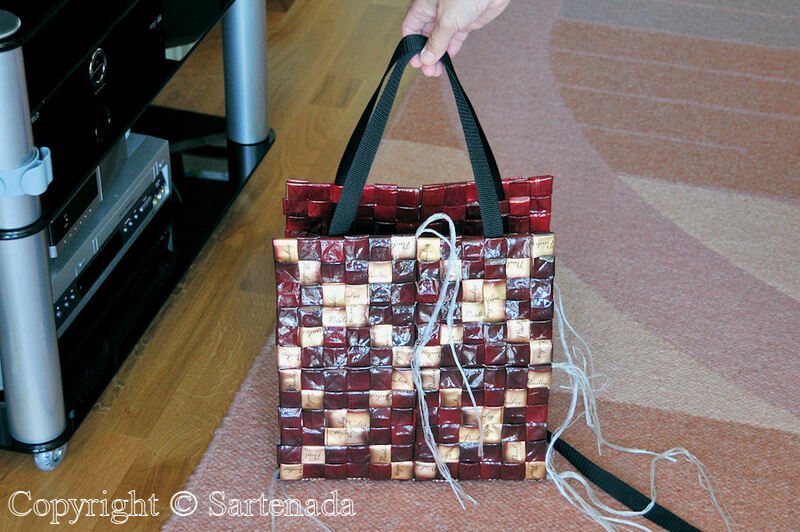 Those bags are very attractive and it’s so interesting to see how to make one. 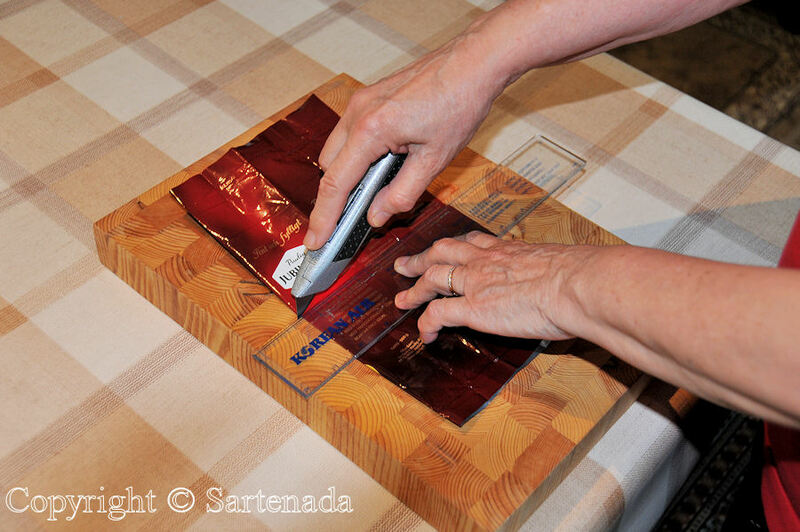 Anja is a very talented craft maker! Thank You praising Anja’s talent. I happy for Your visit and comment. Thank You for Your kind comment. We are doing well and this summer we got nearly hot 87.8ºF which means real summer. I wish that You go on blogging. 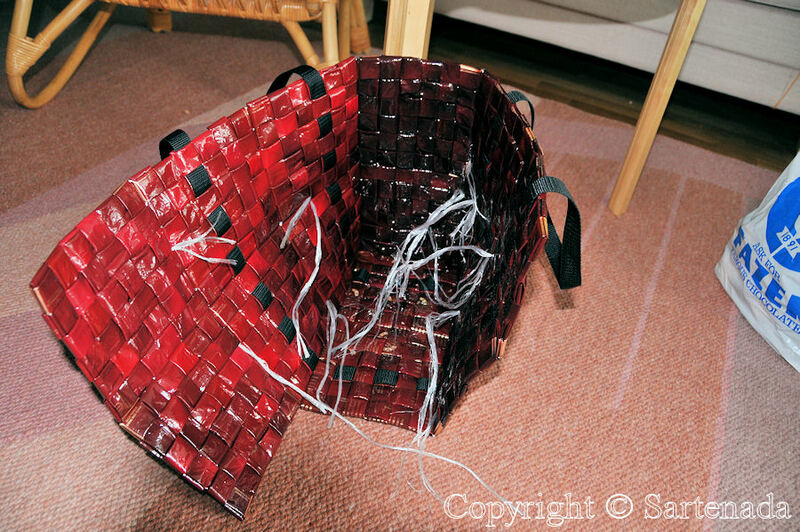 There was the story of the bag which I knit out of grass in Mumin of the animated cartoon. I remembered it. It was the industrial art object which was popular relatively in Japan, but I have not yet made it. I want to challenge it. I am very happy for Your visit and Your kind comment. Thank You. Thank You. Creative – well, yes indeed. What a fun idea! Your wife is very talented and the photos were great. 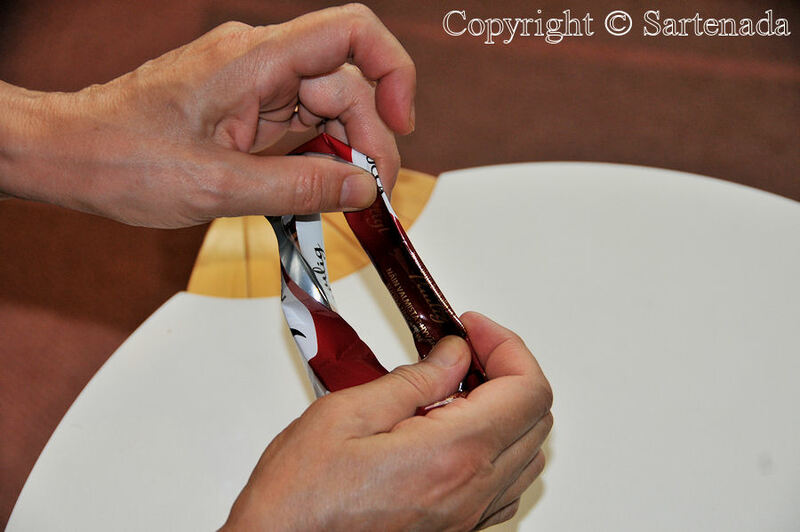 So fascinating to see the process of how a bag was made. 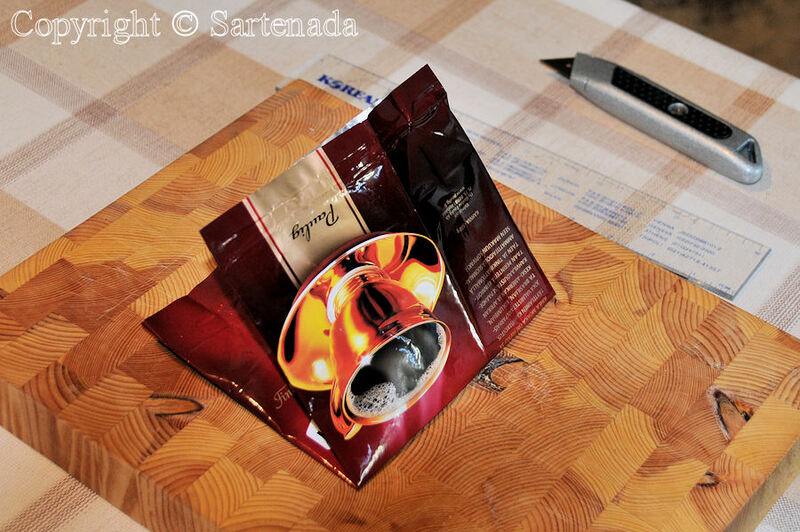 We use the coffee capsules in my family instead of the bags so I have to find a way of making a bag from capsules, haha! 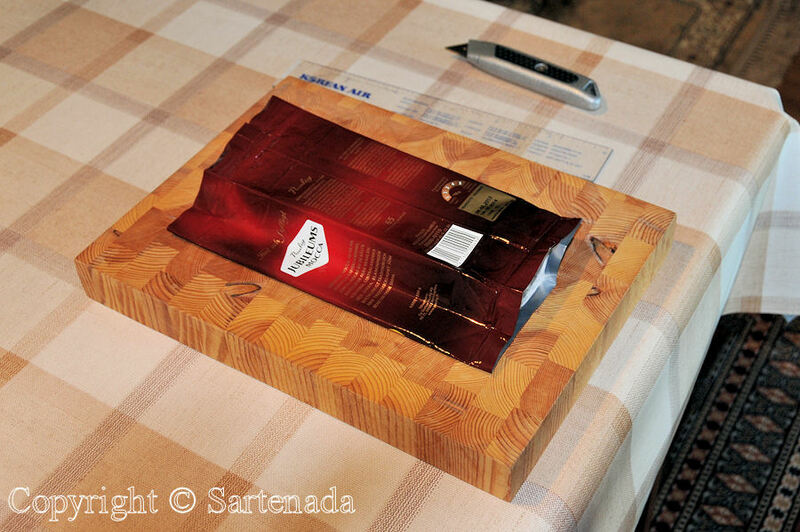 Anyway it is so nice that You loved the idea of this kind of recycling which can be fun and creative. Thank You. You are right they need planning, patience and time. I am glad for Your visit. 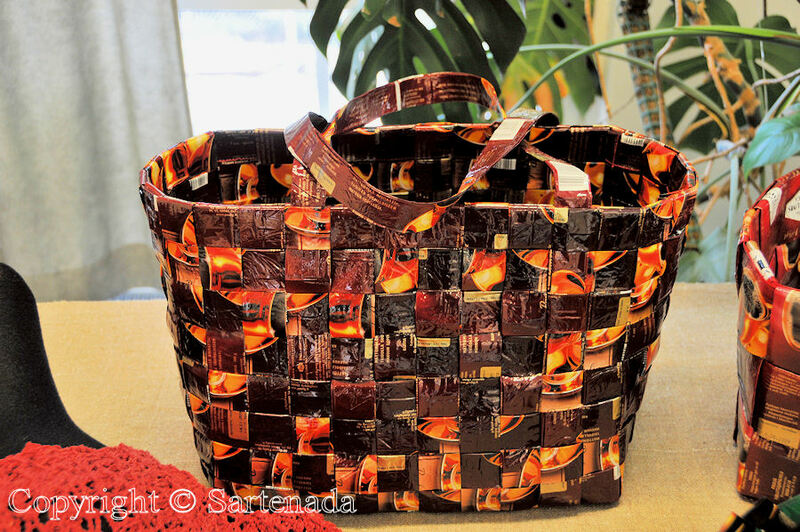 I am glad that You loved these unique bags and baskets. Thank You for Your comment. 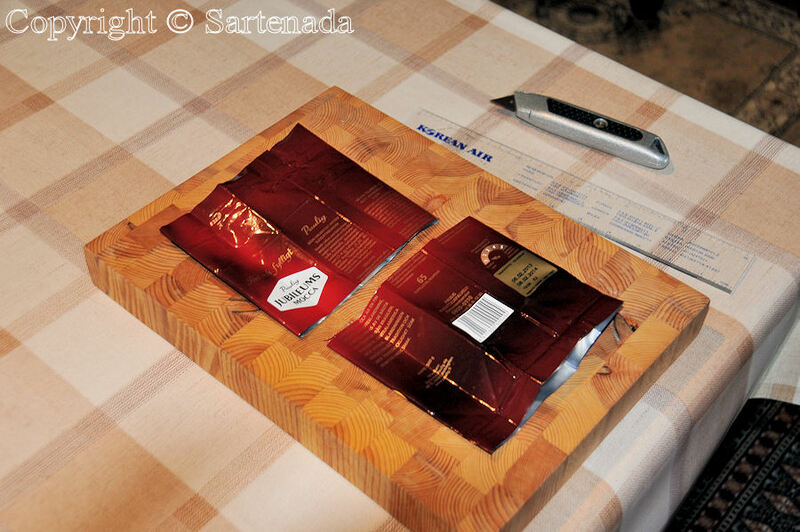 The photo instructions are so clear and concise, and this is such a great way to recycle coffee bags. Beautiful craftsmanship Anja! Very nice to read that You love the idea of this kind of recycling. These are unique, there are not two same. Thank You commenting. No wonder you directed me here. This is, indeed, art. And recycling materials makes this even better. Now if only I drank coffee other than the occasional cup of instant cappuccino that comes in a cylinder. I am happy that You checked these. Well, maybe You have friends who might love the idea and start “recycling” this way, so… Thank You very much leaving Your comment. 26. Wow! This is great! I’ve never seen one before but the bags look beautiful. Thank you especially for showing how to make them as well! Thanks for visiting my blog, too. Appreciate it! I am glad that You find these bags beautiful. Think, they are unique, everybody can make such as she wants. Thank You commenting. How long time make one bag? Thank You for Your kind comment. Well, how long, it all depends from many things. This bag my wife made during three weeks! 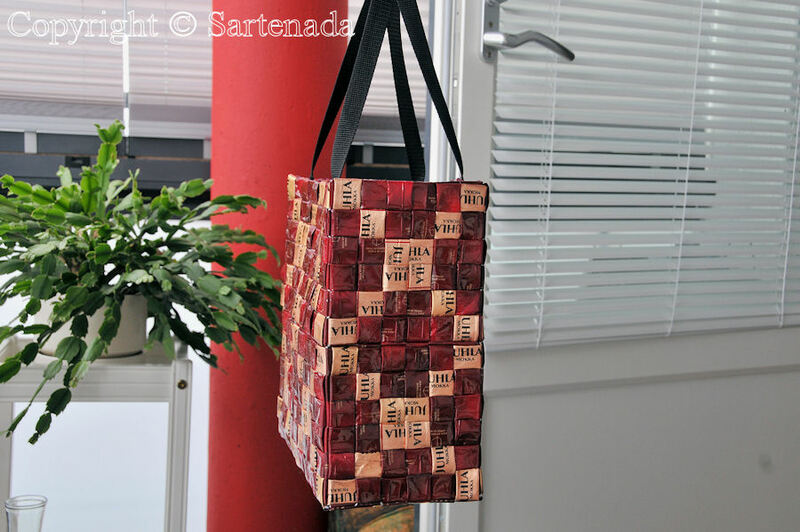 What a fantastic way to reuse coffee bags. I love it! Thank You commenting. I am glad that You love the idea. Love the patterns you have made. 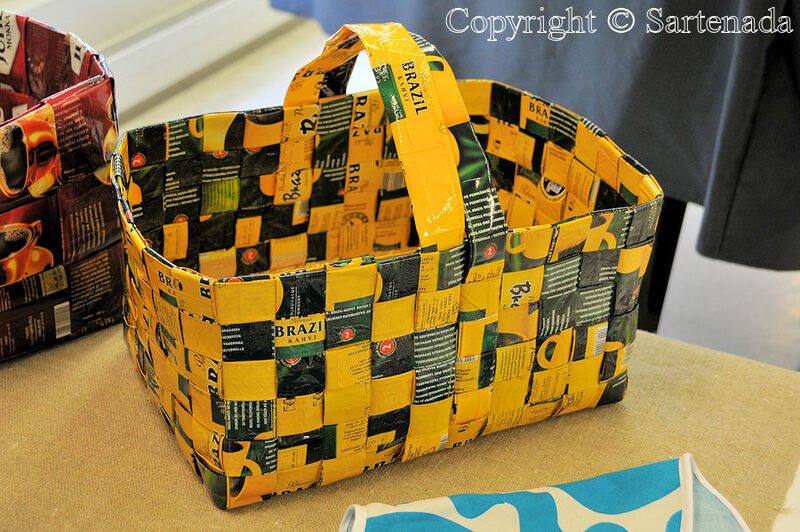 I truly believe we can make gorgeous products out of recycled material and this is a perfect example of that! Nice comment indeed. Thank You. Yes, only imagination is limiting man’s doings and hobbies. I must say that the result is really Gorgeous !!!! Generally speaking people are creative. In my country ordinary people paint art, icons, make bobbin lace, make potteries, porcelain paintings, quilting and beadings. From all these hobbies I have made posts. For example man could think that nobody makes nowadays bobbin lace. I am glad that You loved my wife’s coffee bag. Thank You for Your kind comment. Wow! You really do drink lots of coffee! How creative and resourceful. Welcome to the group of coffee drinkers! 🙂 Thank You commenting. 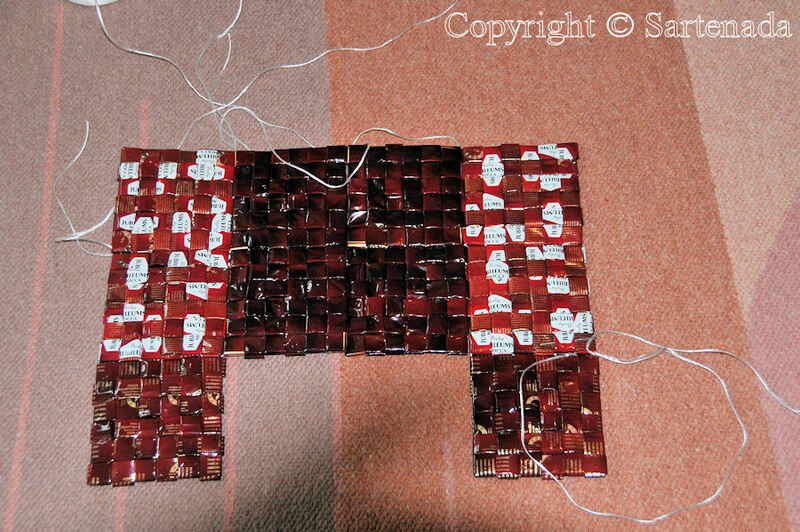 Much later this year there will be another post presenting what more from these empty coffee bags can be made. Fantastic! 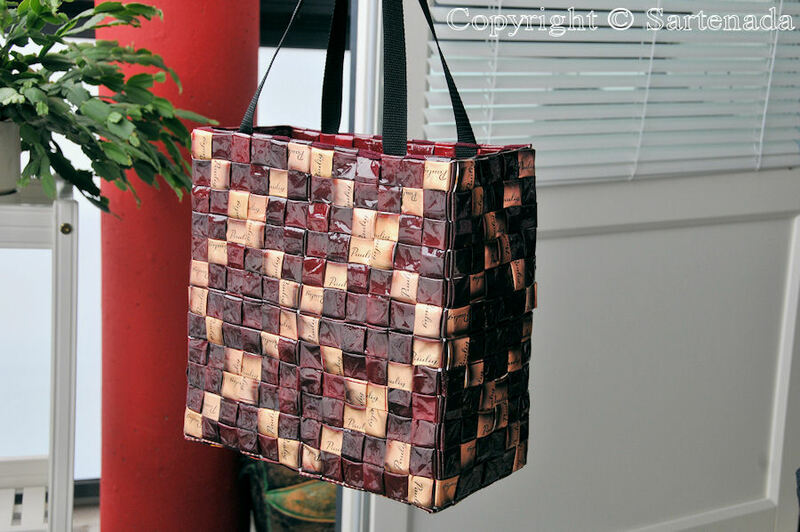 What a great idea and thank you for showing the steps to making one of these bags. They are both unique and beautiful! So nice to read that You love the idea of new kind of recycling. Thank You for Your kind comment. What a cool idea! Recycling is a wonderful way to use products that might just end up thrown away in a landfall. Thank you for sharing. I am happy that You loved this post. My wife has been so glad when hearing praising comments from visitors. Thank You. I was surprised to known the material of the bag. Man is creative. 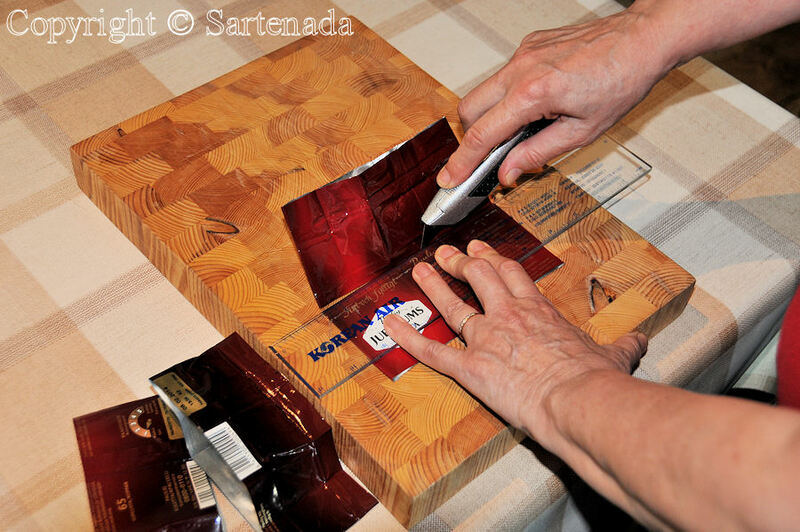 Beautiful and practical things can be created from so many materials. Thank You for Your comment. I love this! I think I may try collecting some coffee bags and giving this a go!!! Sounds so great. I am glad that You loved my post. Thank You. 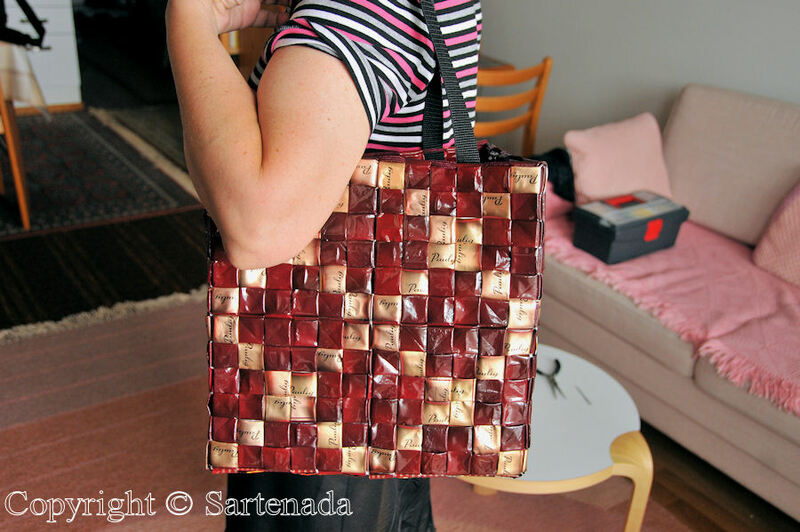 i didn’t realize that such beautiful bags could be made from coffee bags. 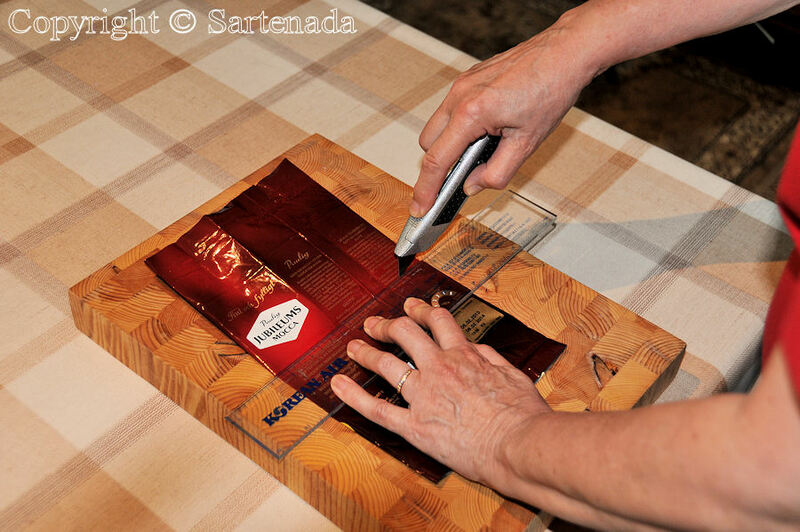 Thank you (and your wife) for showing how the bags are made. This is a very interesting post. Thank You George. I appreciate Your opinion. It was so nice to read that You loved this post. Really impressive to see what they look like in the end. Perfect! Very stylish! Congratulations! I am happy that You love this post and commented it. Thank You. Wauw, lots of work! 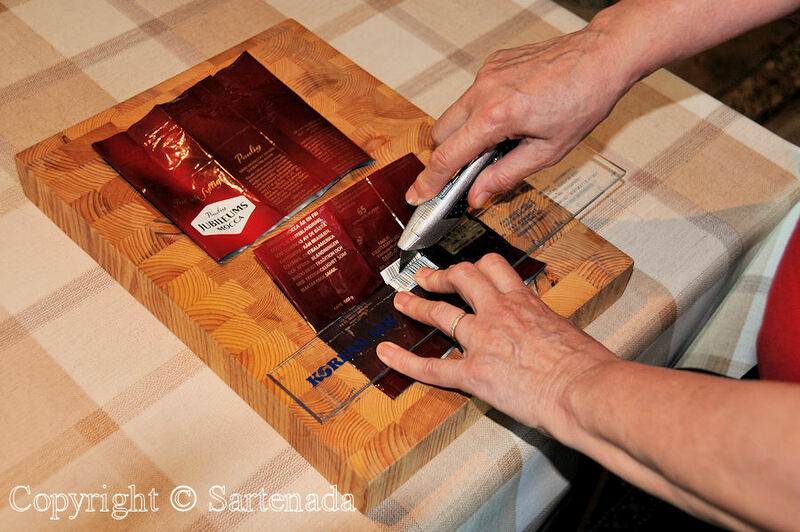 They look great, and thank you for sharing how you make it. Now there is another item I won’t be throwing away, haha, I allready save lots to use in my crafts, now I’ll have to add coffeebags! It would take about a year to have enough to make a bag though probably! I should ask family and friends to save some, also because we vary the brand of coffee we get, so it would take a bit longer to save up enough. Your other bags are lovely too! Thank you for Your kind comment. Regards from our road trip somewhere in Finland. I am happy that You loved my wife’s coffee bag. Thank You commenting. C’est fantastique ! Merci à Anja et à toi pour nous expliquer cette belle récup’ et transformation. Le résultat est vraiment beau. Je ne bois pas beaucoup de café mais j’ai des amies qui seront heureuses de s’essayer à cet art. Merci beaucoup. Je pense que ce hobby est connu seulement en Finlande. Il était donc grand temps de présenter au reste du monde. Plus tard cette année, je montrerai très beau sac à main opéra / théâtre faite par Anja. Cool idea, very impressive with how neat and sturdy it looks! I am glad that You loved the idea. If people are creative they can do so many things. Thank You for Your kind comment. Very kind comment. Thank You. I think that many people in our modern society enjoy doing stuff by their hands and not be passive watching TV all the time. Crafts give satisfaction when man see what man can do. Grazie! Per rendere sacchetto di caffè, ha richiesto molti sacchi di caffè e più di un anno per raccoglierli. (Google translated). 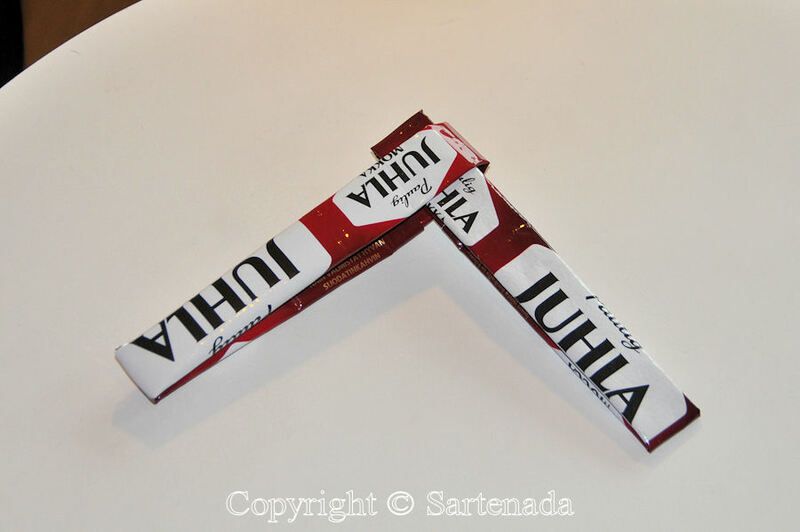 Se on hyva!! :))) Oh this is so smart!! I love the design of the bag! As You read, these are popular here. 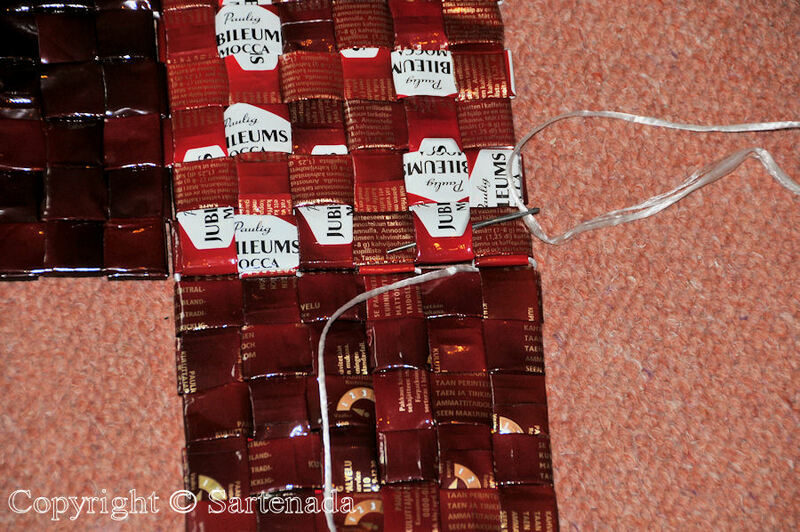 Also the Evening bag made from empty coffee bags is nice in my eyes. Thank You commenting so nicely my post. I am very glad that You loved this post. Thank You for Your praising words. Brilhante idéia, AMEI!!!! Parabéns para sua mulher por fazer um trabalho tao bonito! Muchas gracias, agradezco tu comentario! 🙂 ¡Lo aprecio! These bags are very attractive. Thank You commenting. I am glad that You loved them. I am very glad that you loved my post. Thank You leaving your kind comment. Maly, mon cœur chante en lisant votre commentaire élogieux. Merci beaucoup.